This watercolor illustration was done from a specimen found in the Harcuvar Mts., Arizona, 4 April 1993. This photo was taken by late Joe Brinison. Resting White-lined Sphinx partially fold their wings hiding the pink underwings. When startled the sudden flash of hot pink may distract moth-eating predators long enough for an escape. 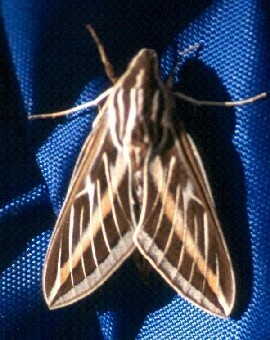 The Five-lined Sphinx is one of the most common of the Sphinx Moths across North America. 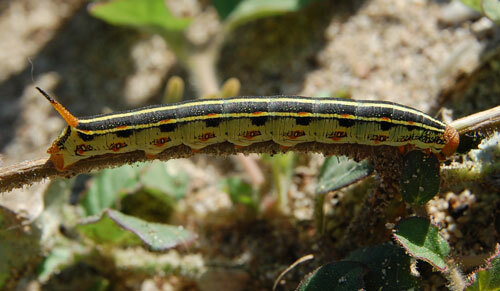 The caterpillars feed on a wide variety of plants, but are particularly fond of plants in the Nyctaginaceae, the which includes Four O'Clocks. These moths are often referred to as hawk moths because of their fast and direct flight habit. These moths fly at dusk or dawn and visit flowers, especially those with long throats and so might be mistaken for hummingbirds. 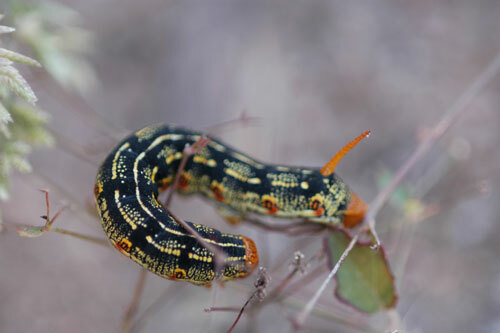 The colorful caterpillers or ‘hornworms’ can be found on a number of plants including four o'clocks. 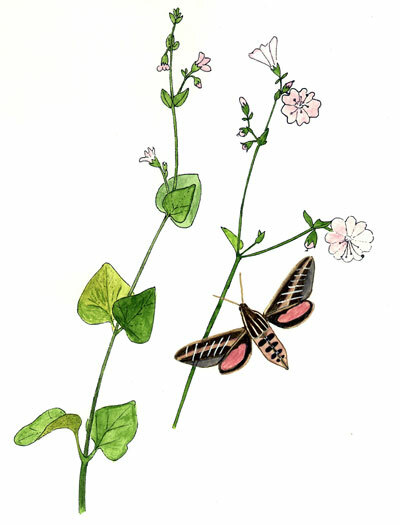 The lower specimen was observed in the Wickenburg Mountains, Arizona feeding on leaves of Trailing Four O'Clock (Allionia incarnata).